President Buhari sacks Patrick Ziakede Akpobolokemi the Director-General of Nigerian Maritime Administration and Safety Agency (NIMASA). According to Femi Adesina, the special adviser to the President on media and publicity, the termination of Mr Akpobolokemi’s appointment takes immediate effect. “He is to hand over the management of NIMASA and all government property in his possession to the most senior officer in the agency who will remain in charge until a new Director-General is appointed,” the statement said. Trade volume between Nigeria and France has reached N1.1 trillion, French Ambassador to Nigeria, Mr Denys Gauer, say. Gauer told the News Agency of Nigeria (NAN) in Abuja that Nigeria was France biggest trading partner in Africa. According to the envoy, France exports to Nigeria is worth N330 billion while Nigeria’s export to France was in the region of N770 billion. “Nigeria is France biggest trading partner Africa but this is mainly because of Nigeria’s oil. “The volume of our bilateral trading relations is around €5 billion. But French exports to Nigeria are only €1.5 million.“ That means our bilateral trade is quite unbalance and it is in favour of Nigeria because of the oil. 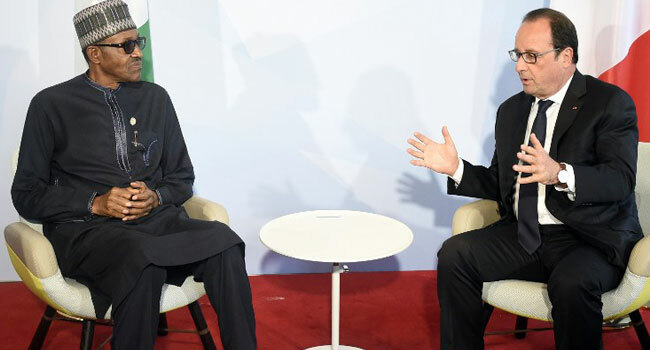 “About 97 per cent of what we are importing from Nigeria is oil and France is exporting to Nigeria mainly oil also but electronic products, pharmaceuticals, machines and electricity equipment”, he said. Gauer said that many French companies are now operating in Nigeria, and that France encouraged more of its companies to invest in Nigeria. “We now have much more French companies present here. We are encouraging more French companies to come to Nigeria and also to establish more partnerships with Nigerian companies. President Muhammadu Buhari will seek help in fighting militants across West Africa when he meets U.S. President Barack Obama in Washington on Monday, according to his spokesman. Buhari is also due to meet U.S. Secretary of State John Kerry, Vice President Joe Biden and the chairman of the joint chiefs of staff during his four-day visit. Around 400 people have died in Nigeria alone in violence linked to the movement since May 29th, according to a Reuters count, adding to the thousands killed in six years of unrest. “Topmost on the agenda … will be measures to strengthen and intensify bilateral and international cooperation against terrorism in Nigeria and West Africa,” Buhari’s spokesman Femi Adesina, said. U.S. forces in the region have flown drones over the remote region to help search for more than 200 schoolgirls abducted in the northeastern town of Chibok last year. Last month U.S. officials said advisers could be sent to Nigeria to train its military and help boost the economy, the largest in Africa, by looking for ways to encourage more investment in its oil and gas sector. Central Bank of Nigeria (CBN) has directed Bureau De Change in Nigeria to include Bank Verification Number (BVN) of customers in its return to the CBN with effect from August 1, 2015. The CBN said the list of all licensed BDCs would be provided by the CBN, to the Nigerian Inter-Bank Settlement System (NIBSS) to enable the company provide the necessary hardware token that would be used by the BDC in accessing the NIBSS website. NIBSS has been directed to make a portal available on its website to facilitate access for the confirmation/validation of the BVN number of the BDCs’ customers. The circular which was signed by Kevin Amugo, director, financial policy and regulation department, CBN, stated that this is to ensure that correct BVN is recorded by the BDC and included in the returns to the CBN. According to the Apex bank, a token transaction fee of N100 would be paid for each access on the portal, while NIBSS will provide the training manual for an “easy to use” operation of the system. All licensed BDCs are also required to provide the BVN of all their director before August 15, 2015 as failure may affect their continued participation in the foreign exchange market. The CBN noted that any BDC operator who fails to provide the required information in their returns, or provides a wrong BVN would be penalized. First offenders will be required to pay a fine of N1 million while any subsequent violation of the requirement may lead to the revocation of operating license of the BDC. India-based international security solution firm, Nispana Innovative Platforms, says it will address issues of security at the 2nd Annual Offshore Security Oil Theft -Nigeria Summit in Lagos. According to Nispana Managing Director, Narendra Kumar, the Nigerian oil industry is plagued by several challenges to achieve its maximum output potential, and due to the prevailing security problems, the industry has suffered immense losses, from piracy, oil theft on and offshore, oil bunkering and poor infrastructure. He said: “The summit will determine and focus to give an insight into the current challenges pertaining to oil theft, pipeline vandalism, funding gap in the oil and gas new exploration project, Maritime Security and environmental issues faced by the oil companies operating out of Nigeria. IMF’s, latest World Economic Outlook: “Slower Growth in Emerging Markets, a Gradual Pickup in Advanced Economies,” urge Nigeria and other emerging economies to prioritize their spending and embrace tax reform in order to overcome the current economic challenges. The report, states that “In many of these economies, demand support should come from fiscal policy rebalancing aimed at boosting longer-run growth through tax reform and spending reprioritisation. “In oil import, lower oil prices have reduced price pressures and external vulnerabilities which will ease the burden on monetary policy. In oil export, public spending should be adjusted to lower oil revenue where there is no fiscal space. Exchange rate depreciation can help to offset the demand impact of oil-related terms-of-trade losses in countries with flexible exchange rate regimes. Structural reforms to raise productivity and remove bottlenecks to production are urgently needed in many economies,” it stated.